Amid market buzz of the promoters of SpiceJet planning to dilute their majority stake, media tycoon Kalanithi Maran, the principal promoter, has decided to increase his stake by five per cent to infuse Rs 184 crore (Rs 1.84 billion) in the airline. This would be the third fund infusion in the airline by Maran since September 2011. 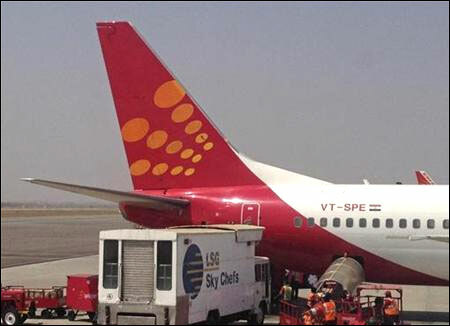 The current one will be aimed at strengthening SpiceJet's balance sheet and expanding fleet, said an official. There were reports Maran and his wife Kavery had resigned from one of the promoter entities of SpiceJet, which triggered speculation on a possible sale of the Maran family's majority stake in the airline. The company denied a stake sale. It said it was talking to some private equity players. Sun Group Chief Financial Officer S L Narayanan said: "Even if you assume they have resigned from another promoter company, it doesn't mean anything". The airline said on Friday it would take a postal ballot seeking shareholders' approval on issuing compulsory convertible debentures (CCDs) of an aggregate nominal value of Rs 130 crore (Rs 1.3 billion) and warrants of an aggregate face value of Rs 15 crore to promoter Maran. Narayanan said that the fresh infusion by Maran would be Rs 184 crore after the conversion at an average price of Rs 36.18 per share. Since Maran had infused money for a 5 per cent stake in April this year, he cannot infuse more money for direct equity as the regulation would not permit it, and hence he opted for indirect stake increase, said Narayanan. Of the total 5 per cent, 3.6 per cent will be debentures and 1.4 per cent will be through warrant. In September 2011, Maran had infused Rs 130 crore for a 5 per cent stake, and another Rs 100 crore (Rs 1 billion) in April 2012 for another 5 per cent. Maran's current holding, according to the Bombay Stock Exchange, is 16.27 per cent. "The money will be utilised to settle some loans getting partly retired and towards pre delivery payment of additional fleets," said Narayanan. A notice seeking approval from the stake holders for issuance of CCDs and warrants stated that it was proposed to allot up to 13 million unsecured CCDs of nominal value of Rs 100 each, which aggregates to Rs 130 crore, to Maran on preferential basis in one or more tranches, at 14 per cent interest per annum payable monthly up to the date of conversion. The CCDs would be convertible into equity shares within eighteen months from the date of allotment and only after April 1, 2013. If the CCDs are not converted within the stipulated period then the same shall be automatically and compulsorily converted into equity shares on the last date. The company also sought approval from the shareholders to allot 1.5 crore (Rs 15 million) warrants with options to allot equivalent number of equity shares of the face value of Rs 10 each of an aggregate nominal amount of up to Rs 15 crore (Rs 150 million). Issue price of both the debentures and the warrants would be determined later, according to the company announcement. The postal ballot notice also seeks shareholder's approval making Kalanithi Maran and his spouse Kavery Kalanithi as directors not liable to retire by rotation (non rotational directors) and re-designation of S Natrajhen as managing director of the company.